Here on Earth, we tend to take air resistance (aka. “drag”) for granted. We just assume that when we throw a ball, launch an aircraft, deorbit a spacecraft, or fire a bullet from a gun, that the act of it traveling through our atmosphere will naturally slow it down. But what is the reason for this? Just how is air able to slow an object down, whether it is in free-fall or in flight? Because of our reliance on air travel, our enthusiasm for space exploration, and our love of sports and making things airborne (including ourselves), understanding air resistance is key to understanding physics, and an integral part of many scientific disciplines. As part of the subdiscipline known as fluid dynamics, it applies to fields of aerodynamics, hydrodynamics, astrophysics, and nuclear physics (to name a few). By definition, air resistance describes the forces that are in opposition to the relative motion of an object as it passes through the air. These drag forces act opposite to the oncoming flow velocity, thus slowing the object down. Unlike other resistance forces, drag depends directly on velocity, since it is the component of the net aerodynamic force acting opposite to the direction of the movement. Another way to put it would be to say that air resistance is the result of collisions of the object’s leading surface with air molecules. It can therefore be said that the two most common factors that have a direct effect upon the amount of air resistance are the speed of the object and the cross-sectional area of the object. Ergo, both increased speeds and cross-sectional areas will result in an increased amount of air resistance. In terms of aerodynamics and flight, drag refers to both the forces acting opposite of thrust, as well as the forces working perpendicular to it (i.e. lift). In astrodynamics, atmospheric drag is both a positive and a negative force depending on the situation. It is both a drain on fuel and efficiency during lift-off and a fuel savings when a spacecraft is returning to Earth from orbit. Here, Pd is the power needed to overcome the force of drag, Fd is the drag force, v is the velocity, p is the density of the fluid, v is the speed of the object relative to sound, A is the cross-section area, and Cd is the the drag coefficient. As it shows, power needs are the cube of the velocity, so if it takes 10 horsepower to go 80 kph, it will take 80 horsepower to go 160 kph. In short, a doubling of speed requires an application of eight times the amount of power. There are three main types of drag in aerodynamics – Lift Induced, Parasitic, and Wave. Each affects an objects ability to stay aloft as well as the power and fuel needed to keep it there. Lift induced (or just induced) drag occurs as the result of the creation of lift on a three-dimensional lifting body (wing or fuselage). It has two primary components: vortex drag and lift-induced viscous drag. The vortices derive from the turbulent mixing of air of varying pressure on the upper and lower surfaces of the body. These are needed to create lift. As the lift increases, so does the lift-induced drag. For an aircraft this means that as the angle of attack and the lift coefficient increase to the point of stall, so does the lift-induced drag. By contrast, parasitic drag is caused by moving a solid object through a fluid. This type of drag is made up of multiple components, which includes “form drag” and “skin friction drag”. In aviation, induced drag tends to be greater at lower speeds because a high angle of attack is required to maintain lift, so as speed increases this drag becomes much less, but parasitic drag increases because the fluid is flowing faster around protruding objects increasing friction. The combined overall drag curve is minimal at some airspeeds and will be at or close to its optimal efficiency. Wave drag (compressibility drag) is created by the presence of a body moving at high speed through a compressible fluid. In aerodynamics, wave drag consists of multiple components depending on the speed regime of the flight. In transonic flight – at speeds of Mach 0.5 or greater, but still less than Mach 1.0 (aka. speed of sound) – wave drag is the result of local supersonic flow. 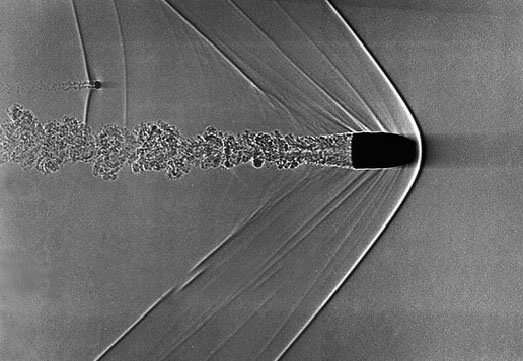 Supersonic flow occurs on bodies traveling well below the speed of sound, as the local speed of air on a body increases when it accelerates over the body. In short, aircraft flying at transonic speeds often incur wave drag as a result. This increases as the speed of the aircraft nears the sound barrier of Mach 1.0, before becoming a supersonic object. In supersonic flight, wave drag is the result of oblique shockwaves formed at the leading and trailing edges of the body. In highly supersonic flows bow waves will form instead. At supersonic speeds, wave drag is commonly separated into two components, supersonic lift-dependent wave drag and supersonic volume-dependent wave drag. Understanding the role air frictions plays with flight, knowing its mechanics, and knowing the kinds of power needed to overcome it, are all crucial when it comes to aerospace and space exploration. Knowing all this will also be critical when it comes time to explore other planets in our Solar System, and in other star systems altogether! We have written many articles about air resistance and flight here at Universe Today. Here’s an article on What Is Terminal Velocity?, How Do Planes Fly?, What is the Coefficient of Friction?, and What is the Force of Gravity? If you’d like more information on NASA’s aircraft programs, check out the Beginner’s Guide to Aerodynamics, and here’s a link to the Drag Equation. We’ve also recorded many related episodes of Astronomy Cast. Listen here, Episode 102: Gravity.